The actor Sawamura Chôjûrô I held this name from Spring 1701 to the 10th lunar month of 1716, then from Spring 1717 to the 1st lunar month of 1734. Date of birth unknown. Son of Sawamura Chôjûrô I, his first stage name was Sawamura Chôzaburô. He took the name of Sawamura Chôjûrô II in 1735 in Nagoya. He went back in 1736 to Ôsaka, where he was active up to his death the 12th of the 1st lunar month of 1739. 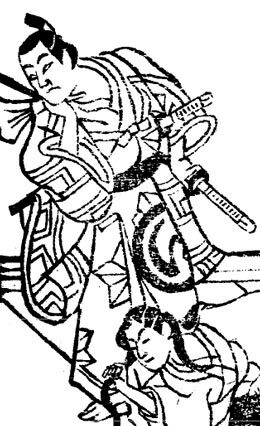 He was a tachiyaku, who was quite skilled in wagoto, but he died before achieving fame for himself. Suketakaya Takasuke I held the name of Sawamura Chôjûrô III from the 7th lunar month of 1746 to the 10th lunar month of 1746, then from the 11th lunar month of 1747 to the 10th lunar month of 1753. Born in Edo. He started in career during the 1730s, performing in koshibai under the name of Okada Kamejirô. 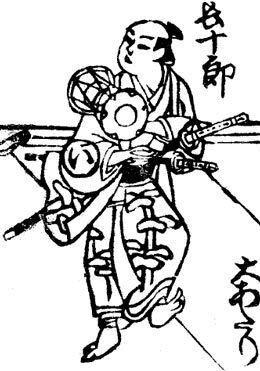 He changes his name to Okada Kamejûrô in the 11th lunar month of 1738. 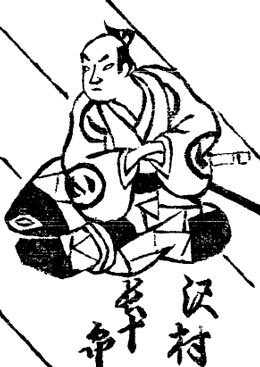 He became a disciple of Sawamura Sôjûrô I in fall 1739 and was allowed to receive the name of Someyama Kijûrô II in the 11th lunar month of 1739 at the Nakamuraza, where he performed in the kaomise drama "Miyakozome Kaoru Hachinoki". 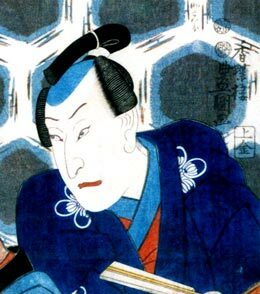 He became katakiyaku and changed his name to Sawamura Kijûrô I in the 11th lunar month of 1741 at the Nakamuraza, where he played the role of Urabe Iganosuke in Hayakawa Denshirô's kaomise drama "En'ya Hangan Kokyô no Nishiki", which welcomed in Edo the actors Sanogawa Mangiku, Nakamura Shingorô I, Nakayama Shinkurô I and Nakamura Tomijûrô I. He went on tour in Kyôto in Fall 1752 and was back in Edo after one full season in the Imperial City. He became tachiyaku in the 11th lunar month of 1753 at the Moritaza, performing in the kaomise drama "Masakado Kokyô no Nishiki", which celebrated the shûmei of his master Suketakaya Takasuke I and Ichikawa Sôzaburô II. 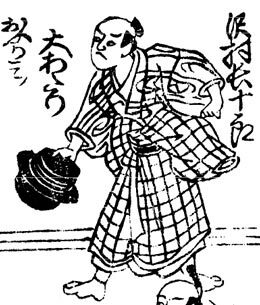 He took the name of Sawamura Chôjûrô IV in the 11th lunar month of 1772 at the Moritaza, performing in the kaomise drama "Izu Goyomi Shibai no Ganjitsu", which also celebrated the shûmei of Sawamura Kijûrô II and Mikuni Fujigorô. He finally took the name of Sawamura Kameemon in the 11th lunar month of 1787 at the Moritaza, performing in the kaomise drama "Tsuranaru Edamure Takamatsu", which also celebrated the shûmei of Iwai Kiyotarô II and Sawamura Harugorô II. We don't know what has happened to him afterwards for he disappeared from the records. He was the father of Sawamura Kijûrô II and the master of Sawamura Kinjûrô, Sawamura Wadazô and Sawamura Sawazô. There will be in the future to come a full page dedicated to Sawamura Kameemon in kabuki21.com. The actor Suketakaya Takasuke III held the name of Sawamura Chôjûrô V from the 11th lunar month of 1848 to the 9th lunar month of 1852. 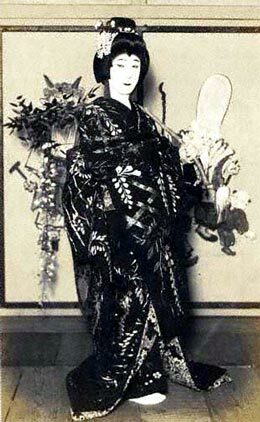 The actor Sawamura Chôjûrô VII held this name from September 1911 to the end of the 1930s (? ).